While #optoutside started as a way to change behaviors on Black Friday, it’s bigger than one single day. It’s a choice you make every day. You’ve heard it before: being outside is good for you. Good for your health. Good for your attitude. Spend some time taking care of yourself . . . instead of spending money. We’ll be out there. And we hope you’ll join us. Some of us will be on a lake. Others will be monkeying around. Or walking their dogs off. A few of us might decide to ride through the woods. And a special few will be paying it forward. There are just a few of the endless ways to #OptOutside. We hope you find your favorite way and get to do it this weekend. You’ll thank yourself. Next Post Mornings. Am I right? I clicked the link because there was a picture of someone walking on a raised board walk trail. Sad to see no information about that trail in the article. And, the pictures in the article don’t include references to their locations. Thanks for taking the time to comment, Loren. You raise a good point; the photos tell a fuller story when they’re captioned with locations. Probably common to photo libraries everywhere, we’re not always consistent with labeling locations, but most of them in this post have been identified and now include captions. 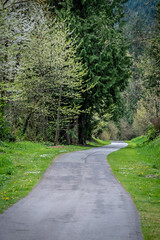 The boardwalk photo was taken at the Grand Ridge forest (https://www.kingcounty.gov/services/parks-recreation/parks/trails/backcountry-trails/grand-ridge.aspx). I hope you find it someday. Happy New Year!